This article by SisterToldjah first appeared at American Lens News on Nov. 23, 2016. Restoring the trust between readers and journalists by reporting the facts would be a priority, one might conclude. Such doesn’t seem to be the case with the Raleigh News and Observer (N&O). Like its sister publication the Charlotte Observer, change is difficult. Oh, not when it comes to demanding everyone else “overcome their discomfort” with change, like women who want to maintain privacy and security in bathrooms and fitting rooms. Instead, their problems relate to correcting their errors when they’re pointed out. Others, including WWNC’s Pete Kaliner, later notified him of the inaccuracy of the tweet as well. But as of this writing, Campbell’s tweet is still up and the retweet count continues to grow. Conservatives have long complained that the N&O’s reporting on progressive groups in North Carolina is one-sided, incomplete, and favorably biased, with minimal balanced coverage and attention being given to their web of funding resources. 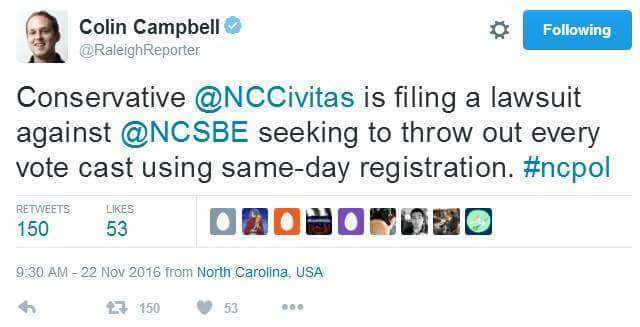 The state GOP’s frustration with how these groups are featured, rather than scrutinized, in the N&O speaks to that. This isn’t the first time, by the way, that the N&O has been alerted to factual errors in tweets – nor is it the first time those notifications have been ignored* (see update at the bottom of this post). It also should be noted that, unlike several of Campbell’s tweets on the issue, the reporting on their website about the Civitas case is largely correct. Yet the branding of a news org is not just in what’s on their websites and print/audio/video media. It’s also represented on the public Twitter and Facebook pages their writers use to report scoops, teasers, and breaking news on behalf of their respective news outlets. The accuracy of what’s reported there is just as vital as that of any piece that ultimately gets published, especially when you consider the growing number of people who get their news from social media sources. If the N&O (or Charlotte Observer) wants to be selective in how they spin facts from a slanted perspective as it relates to current events on their editorial/opinion pages, that’s fine. But when it comes to objective news reporting, especially on important political issues impacting North Carolinians, it’s imperative that they do better. The staff of American Lens appreciates the correction. This entry was posted in Am Lens, ELECTIONS, Media Bias, News and Observer and tagged Civitas Institute, News and Observer, Sister Toldjah. Bookmark the permalink.